April 5, 2017 - UWF Chamber Choir provided a vocal backdrop for the UWF Labyrinth Experience​ - an inter-departmental display in the UWF Commons. Read the story here. March 3, 2017 - the women of the UWF Singers joined the Pensacola Symphony Orchestra, the Pensacola Opera Chorus, and the Pensacola Children's Chorus in a performance of Mahler's 3rd Symphony under the direction of Maestro Peter Rubardt. Read the review here. December 23, 2016 - NPR station WUWF aired a holiday broadcast featuring the music of the UWF Singers, Perdido Brass, and Pensacola Choral Society​. Listen to the broadcast here. November 16, 2016 - UWF Singers were the keynote event at the UWF 50th Anniversary Gala with guest conductor/composer Eric Whitacre. View the extensive photo album here. October 4, 2016 - NPR station WUWF did a radio feature about our Collaborations! concert with USA Chorale. Listen to the interviews and recording clips here. November 15, 2015 - The Pensacola News Journal published pictures taken at the 2015 Foo Foo Festival event at Maritime Stadium. The UWF Singers provided choral voices to Verdi's Va Pensiero, and a military medley featuring the guest tenor artists. Click here. October 16, 2015 - Read the Voyager's coverage of the UWF Singers and Chamber Choir concert Lullabies, Love Songs, & Requiems: A Poetic Journey​. Click here. 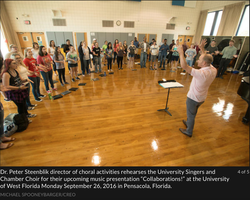 September 24, 2015 - The Pensacola News Journal began their coverage of Dr. Judy Bense's "State of the University Address" with an excerpt from the UWF Singers' performance of The Star-Spangled Banner. To listen, click here. 2013 - Read the PNJ's review of the PSO/UWF Singers performance of Debussy's The Sirens. Click here. March 8, 2011 - Read the PNJ's review of the PSO/UWF Singers performance of Holst's The Planets. Click here.